MORE COMPACT. ALL DAY COMFORT. The Milwaukee Headlamp delivers 300 lumens of TRUEVIEW High Definition output. It's compact, lightweight design and washable, sweat absorbing micro-fibre strap give users all day comfort when worn on the head. Get up-to 31 hours of runtime with 3 light output modes to manage brightness and runtime. A water, dust and drop resistant body and lens allows it to withstand the toughest conditions. Direct light by pivoting the light head using 7 positive stops. Included are four clips for secure attachment to hard hats. The Milwaukee Headlamp is covered by a Limited Lifetime warranty. This GI dust collector is a high quality collector that will meet your dust management needs and applications. The totally enclosed, fan cooled, permanently lubricated, Industrial duty motor is specifically designed for continuous use. It is designed to be portable and mobile on four heavy duty swivel casters. This dust collector is user friendly and can move around your shop at great ease. The Safety lock-out switch with removable key, helps prevent unauthorized use. The precision spin-balanced impeller for smooth operation and minimal noise. Includes Heavy-duty collection bag made from extra thick, transparent, recyclable plastic and washable, extra fine 2 micron filter bag. This BT8010 with a powerful 3/4HP motor, can be used for the general cleanup of light commercial properties, and/or vacuuming hard surfaces or carpets. It is designed to collect, capture and control dust generated by hand held power tools, surface preparation equipment and manufacturing machinery. Dust collectors are engineered to effectively remove airborne particles produced by a machine or tool such as woodworking machinery. Dust collectors are ideal for minimizing saw dust and other foreign materials typically generated from bench top and stationary saws. Our collector includes a 6.5 ft. Flexi dust extraction hose, transparent replaceable plastic lower collection bag allows view of dust accumulation and a cloth upper collection bag. 300-Lumen LED Headlamp MORE COMPACT. ALL DAY COMFORT. The Milwaukee Headlamp delivers 300 lumens of TRUEVIEW High Definition output. It's compact, lightweight design and washable, sweat absorbing micro-fibre strap give users all day comfort when worn on the head. Get up-to 31 hours of runtime with 3 light output modes to manage brightness and runtime. A water, dust and drop resistant body and lens allows it to withstand the toughest conditions. Direct light by pivoting the light head using 7 positive stops. Included are four clips for secure attachment to hard hats. 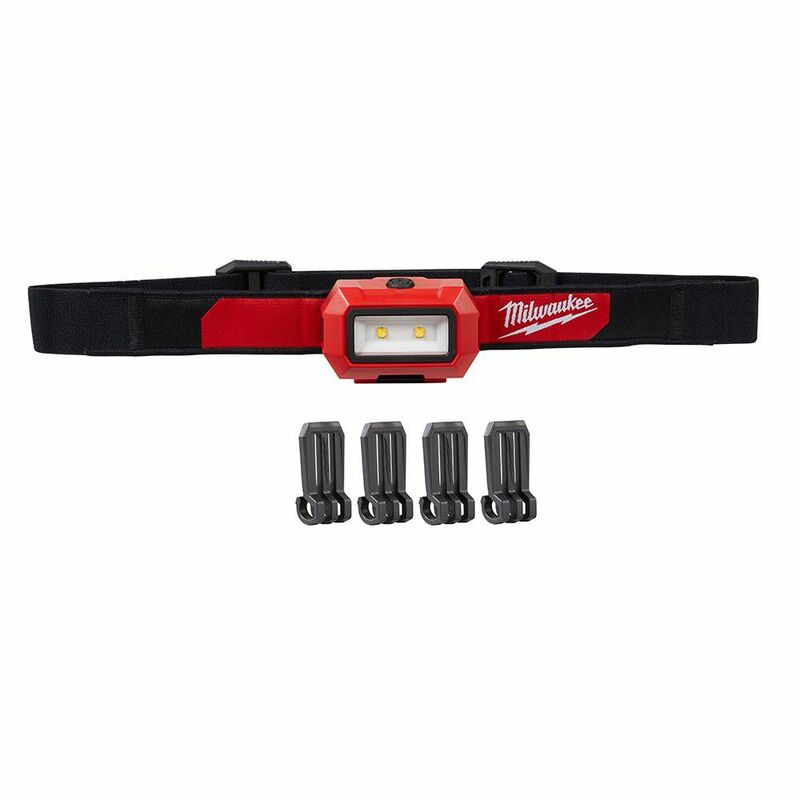 The Milwaukee Headlamp is covered by a Limited Lifetime warranty. 300-Lumen LED Headlamp is rated 2.3 out of 5 by 3. Rated 1 out of 5 by Lloyd from Don't buy! The head light clip broke off it's bracket. This was a extremely poor design for a Milwaukee product. The light is bright and since I glued back on the bracket it will have to do.. Rated 5 out of 5 by Gibby18 from Works great, light weight and very bright Just bought this recently, a little pricey but no regrets, have used it often, works great and very bright. Rated 1 out of 5 by romy from Junk Faulty product. Not worth the money. Goes on and off all the time.